This beautiful Hoosier Cabinet is a reproduction of an original that was popular in the early 1900's. 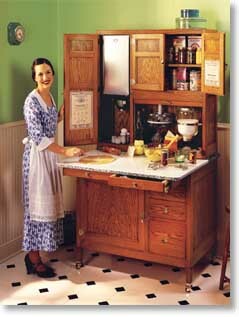 It was often called "The Woman's Work Bench" as no other kitchen utility in the world offered all of the ingenious "Time and Work-Saving" features of the Hoosier Cabinet. Placed anywhere in your home, this Hoosier Cabinet will add Country Elegance and will always be a topic of conversation. A fully functional Hoosier Cabinet with all of the features is truly a sight to be seen. They are beautiful! There is plenty of room to display your favorite collectibles. A completely restored Original Hoosier Cabinet of this type typically sells for several thousand dollars. Hoosier Cabinets have been harder and harder to find "In any Condition". 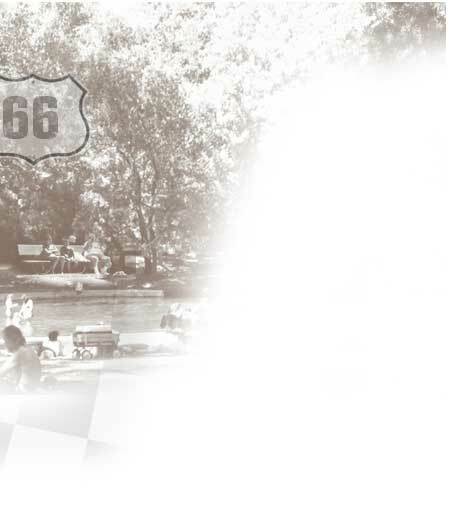 Our reproduction has all of the special and distinguished features of the original and it will last a lifetime. See "COUNTRY FURNITURE ICONS" for more info. 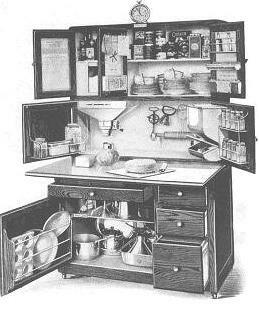 There are many distinguishing features in this Hoosier Cabinet. The base cabinet includes a door on the left side with a door rack mounted on the inside of the door and a shelf inside. In addition, there is a drawer above and three drawers on the right side with the lower drawer being a metal-lined Bread Box. A pull-out porcelain worktop is included to extend the work area when cooking or baking. The Upper Section also has many prominent features. The lower portion has two doors. There is a utility rack on the inside of the right door and a door shelf on the inside of the left door. On the inside of the cabinet there is a Flour Bin w/Sifter, Sugar Bin, Carousol Spice Jar Rack and a Glass Rolling Pin. The upper portion has three doors. The upper right door has an Extract Rack and a Coin Tray. The middle door has a Clock Card and the left door has a Menu Meal & Salad Card. All of these items are exact reproductions of the originals. 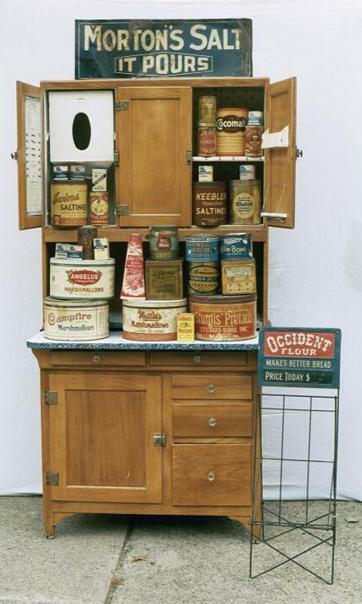 This Hoosier Cabinet even includes the "Anti-Proof" Casters as originally used to prevent ants and other insects from getting into the cabinet. This Hoosier Cabinet is handcrafted using Solid Oak Wood and is finished in a rich golden oak or a dark oak finish. Oak was the wood normally used during this time period. Other woods and finishes are available. See WOOD/FINISHES. Other sizes and styles are available. See CUSTOM ORDERS.